This Conference exposes interns to staff and leaders in the different branches of government as well as members of non-government organizations that partake in important advocacy for the Asian Pacific American community. This year’s Conference was held over two days, from Thursday, July 14, to Friday, July 15, 2016. The Conference began on Thursday morning with a panel discussion on press and legislation. Adam Carbullido, Communications Director for the Office of Congressmember Madeleine Bordallo (Guam), and Dao Nguyen, Senior Policy Advisor for the Office of Congressmember Adam Schiff (CA-28), engaged the interns in a discussion on how the policy and press teams within a legislative office work to shape the nation’s public policy. Our interns were given a crash course on the roles and responsibilities each team and staffer played within legislative offices. Additionally, they were given advice on how to thrive in the cutthroat atmosphere of the Hill. Adam stressed, “Be flexible in your role,” as he discussed his career path from an intern to a senior staffer. He insisted that those who were open to different opportunities will be better equipped to grow from their experiences. Dao shared, “I came to DC from California with no job prospects but eventually it all fell into place,” highlighting the importance of taking risks to later achieve success. After the engaging panel in the Rayburn House Office Building, the interns traveled to other side of the Capitol to the Hart Senate Building to participate in the “Senate Democratic Latino Summit: The Rise of the Latino Electorate” hosted by the Senate Democratic Steering and Outreach Committee. The highlight of the program was the keynote speech of U.S. Department of Housing and Urban Development (HUD) Secretary Julian Castro. With the interns both serving in HUD, they were enthusiastic to see Secretary Castro speak on the importance of empowering marginalized communities. The Secretary stressed, “We have the chance to create a new bottom line for the American people… One that fights for opportunity for all of America.” Edwin, who looks up to the Secretary as a role model Latino leader, was greatly moved by the speech and appreciated the Senate for hosting the Summit and its commitment to diversity in political leadership. The early afternoon was filled with a meeting with Nisha Ramachandran, Policy and Operations Manager for the National Council on Asian Pacific Americans (NCAPA). Nisha discussed the importance of the work of NCAPA in fostering a coalition of national organizations focused on advocating for the APA community. She emphasized how fundamental the relationships between NCAPA member organizations were to fighting for the issues in our communities and stated, “There is strength in numbers and power in unity.” Additionally, she gave guidance to our interns on how they can progress in their careers after graduation. Through sharing her experiences of serving as a Congressional Fellow for the Asian Pacific American Institute for Congressional Studies, our interns learned about channels to develop their policy and advocacy skills to be a leader for the community. The last meeting of the day was with Jian Zapata Kim from the Department of Commerce. She elaborated on the process of becoming a political appointee and gave insight on how the working dynamics within an agency changed at different points in the Presidential term. Jian also spoke on the importance of building a professional network to include “mentors that can guide you along the way and sponsors who can vouch for you to move you forward.” The interns appreciated her candid insight on how to develop a career through a network and were hopeful to build a meaningful relationship with her with the remaining time they had left in DC. The second day of the Capitol Conference began with a quick tour of the history of the Capitol. 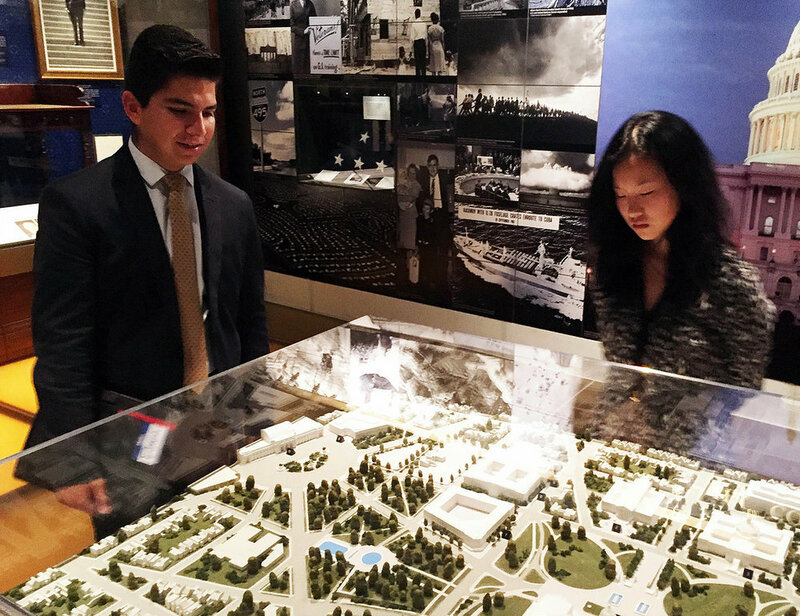 The Capitol Visitors Center had a great exhibit on the evolution of Washington, DC as the nation’s capital and provided our interns with a crash course on the history of Congress. After the exhibit, the interns headed to meet with Jennifer Tran, Advisor for the White House Initiative on Asian American and Pacific Islanders (WHIAAPI), housed within the Department of Education. Jennifer spoke on the history of WHIAAPI and the important issues the Initiative focused on. The interns were eager to learn about their work on data disaggregation and Jennifer reiterated, “The data we gather helps inform our government on how to better target and serve the AAPI communities that need resources the most.” Additionally, the interns were treated to a quick tour of the office and had the pleasure of meeting with Doua Thor, Executive Director of WHIAAPI, and other staffers from the Initiative. The next meeting was with Marita Etcubañez, Director of Strategic Initiatives for Asian Americans Advancing Justice – AAJC. With the interns’ interest in social justice work, the meeting with Marita helped shed light on the grassroots efforts that APA organizations in DC participate in. The interns were very interested in learning about the organizations work in affecting public policy and were astounded by the organization’s advocacy campaigns, growing impact litigation work, and community organizing efforts. With so many programs going on, Marita stressed that “APA is not a monolithic group… We must attack the issues from all different sides.” Blessing shared her aspirations to become an attorney in the future and appreciated the meeting with AAJC to know that there are strong organizations working hard in the legal field to help defend and protect the rights of marginalized communities, such as the APA community. After a quick lunch, the interns headed back to the Hill for their last meeting with Shelley Su, Policy Specialist for the House Committee on Foreign Affairs. The interns both spent time overseas as part of exchange programs, so they were deeply interested in learning how foreign policy is crafted through the legislative branch. Shelley spoke on the important work done by committee staffers to shape the policies that are put forth by Congress members. Our interns learned more about the behind-the-scenes work done within Committees and appreciated Shelley for taking the time to further elaborate on an often over-looked part of the legislative process. The Capitol Conference allowed the Leadership Academy interns to network with and learn from many different individuals in the DC political world. A common theme from our meetings was that to achieve success one must seek help and guidance from those who have gone before him or her. This Conference was made a major success due to the generosity and care shown by our speakers to help build the next generation to become leaders for the future.